These five people are making Milwaukee a better place for all. While you spend your time today watching football and eating absurd amounts of turkey, take some time to think about those you are thankful for. Be it your parents, siblings, spouse or favorite local columnist, make sure to tell them how much you love them. 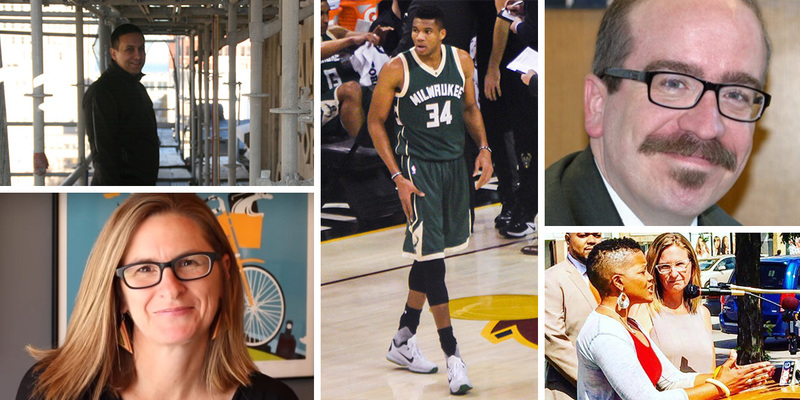 And with that in mind, let’s take a moment to thank five special people that are making Milwaukee a better place. Jim Owczarski is a man of many hats. You might know him as the villain at the Bristol Renaissance Faire or “Jim from the South Side” on the football-focused PackerVerse radio show, but we should all be thankful he’s the City Clerk. Owczarski has held the position since 2012, having been elected by members of the Milwaukee Common Council. In that role he leads a department that is responsible for everything from managing the city television station and handling license applications to ensuring the council follows their own rules and any other laws. We would all certainly be worse off without Owczarski on the job to answer questions and add a layer of sanity to Common Council proceedings. He’s a true public servant. Milwaukee could solve a lot of its problems by cloning Juli Kaufmann. The real estate developer has gone from Riverwest to Walker’s Point to Lindsay Heights, leaving a trail of positive and innovative projects behind her. She’s now set her sights on Sherman Park with her Sherman Phoenix marketplace project. The project will transform the burned shell of the BMO Harris Bank on W. Fond Du Lac Ave. into a community-focused marketplace. She’s partnering with my next honoree JoAnne Sabir on the project, similar to what she did with Jeremy Davis on the Wally Schmidt Tavern redevelopment in Lindsay Heights. Kaufmann continues to do projects focused on improving some of Milwaukee’s most challenged areas, be it in the 53206 zip code, the city’s most impoverished, or a building destroyed during the Sherman Park unrest. But it’s not just the projects she does that are noteworthy. Kaufmann’s secret sauce is that she develops her projects with local partners and local investors with an overarching focus on developing assets to build wealth in the community, not extract it. We would all be much healthier if we started living like JoAnne Sabir. A marathon runner and healthy living advocate, Sabir operates The Juice Kitchen with her husband Maanaan. The business located at 1617 W. North Ave. is a block from the Sabir’s home and just one of the many ways Sabir is making the city better. She’s also partnering with Juli Kaufmann on the Sherman Phoenix marketplace. That Sabir is committed to the city is no surprise; the Milwaukee native comes from well-grounded parents: her mother Sharon Adams is the founder of the Walnut Way Conversation Corp. and her father, Bill Johnson, was the longtime head of the Urban Economic Development Association. If you have a historic building in Milwaukee, Joshua Jeffers has a plan for it. At least that’s how I assume he operates. The developer has made a name by taking on the complicated stuff no one else will touch, and he’s doing so at a blistering pace. He’s restored the Mitchell and Mackie buildings to their former glory, and is now proposing the Broadway Connection apartment building in the surface parking lot behind them. He bought the now-closed St. James Episcopal Church and will reinvent it as an event venue, with a new event hall and apartment building attached to the rear. He’s a partner in the plan to buy, redevelop and lease-back the Milwaukee Athletic Club by creating a new hotel and revamping the club. He recently led the redevelopment of the former Garfield Avenue School with co-developer Melissa Goins. The list goes on, but suffice it to say Jeffers is keeping Milwaukee’s historic buildings alive and vibrant. The Greek Freak made his way onto my Milwaukee Valentine’s list, which should probably mean there’s no need to praise him again. But then he went and became a better basketball player, and seemingly an even better person. Plus, he moved into the city. With the Milwaukee Bucks no longer practicing in St. Francis, the Antetokounmpo family dumped their St. Francis digs in favor of a couple apartments on the north end of Downtown. Moving led to Giannis tweeting about his plans to hold a garage sale, which would have been the best attended sale in Milwaukee history had team officials not talked him out of it. Just before the season started Giannis’ father unfortunately passed away, and he responded by putting up on-court stats in line with those of all time greats like Michael Jordan and Kareem Abdul-Jabbar. He also recently spent a couple hours signing autographs at a Pick ‘n Save in Hales Corner (an appearance usually reserved for rookies and role players), refusing to leave until he signed something for everyone in line, including a frying pan likely purchased from a nearby aisle. Herb Kohl used to have a sign on his Senate desk that said “the Bucks stop here,” but it’s time to put that slogan on a billboard with Giannis. Great reporting, many thanks. Already familiar with Juli, Jim, and Giannis, look forward to learning about Sabir and Joshua. Happy Thanksgiving to everyone at UM.